Gift of Mrs. Thos. H. Allen. Before 1906? Pat Dorley, Barber; Herman Paulling [sic. Pauling], Druggist; Jack's Saloon; Koehlers  Blacksmith Shop; Bethke Meat Mkt. ; Bickner's Store; Dupree House - Hotel. 3 col, 29062. Description Scanned as B & W; penciled marks on front; creases. 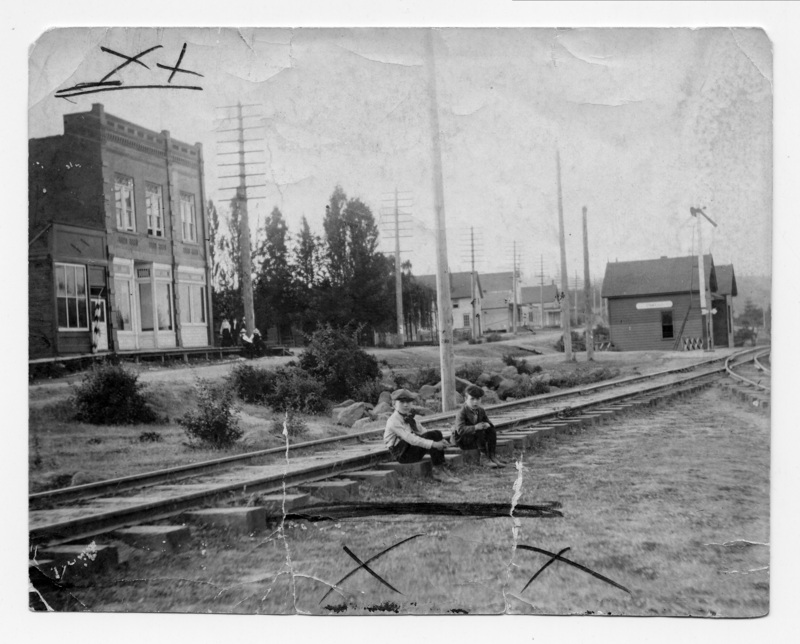 Caption for this photo in the Oswego Review, July 28, 1949: "The view above was taken across the railroad tracks looking up State Avenue, with the Southern Pacific station in the foreground, and the busy Oswego Pharmacy corner shown as a grove of trees ..."
Transcription Gift of Mrs. Thos. H. Allen. Before 1906? Pat Dorley, Barber; Herman Paulling [sic. Pauling], Druggist; Jack's Saloon; Koehlers Blacksmith Shop; Bethke Meat Mkt. ; Bickner's Store; Dupree House - Hotel. 3 col, 29062. Physical Description H 3.75" X L 4.5"